At the DARPA facility in the Southwest, the guards finally manage to regain access to the lab Baxter sealed off. As they inspect the seemingly abandoned room, they find Baxter’s corpse sitting in a chair. The top of his head has been sliced off and his brain is missing. Suddenly, one of the many robots lining the walls comes to life and kills all three guards. 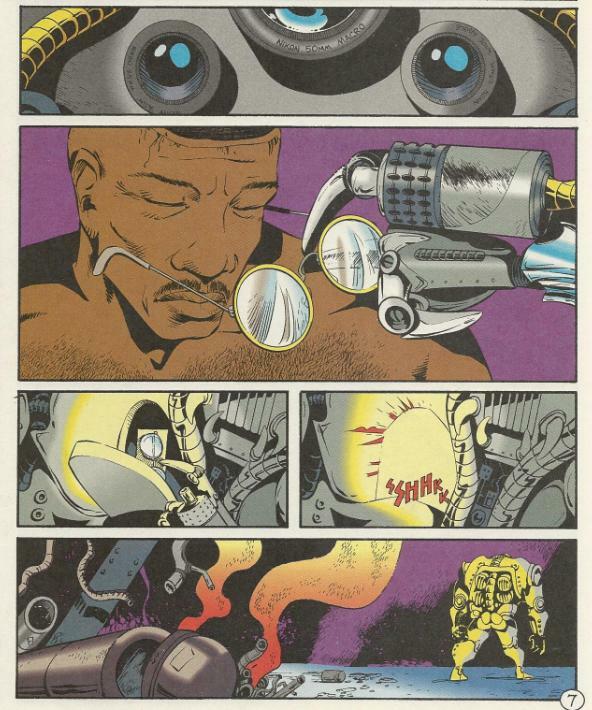 The robot approaches Baxter’s corpse and gently takes his glasses before walking off. In an attic somewhere, Raph is snooping around. Among the gothic knick-knacks mothballed in the attic is a huge gargoyle (which Raph hopes won’t come to life like a previous gargoyle he encountered). Raph walks over to a shuttered window and opens it. He’s in the attack of an old church. Raph remarks to himself that the place is perfect. Back in Northampton, Don is making lunch in the kitchen of the farmhouse when he sees a cop car pull up. He ditches as soon as he sees the officer (named Longer) come in through a window, looking for squatters. Officer Longer radios dispatch and says that he scared a squatter off and that the owners of the farmhouse should be notified. Dispatch tells him that the farm is owned by Arnold Jones, a name Officer Longer recognizes. At the apartment in New York, one of the tenants (Mr. Braunze) steps onto the fire escape to greet the morning. His neighbor, Miss Tillet, isn’t so happy and complains to Braunze that the new owner (April) has raised the rent. Furthermore, she’s upset that April is living out of wedlock with a man and raising a child, no less. Braunze waves off her complaints and tells her that everyone has done something in their lives that others would find objectionable. Down in the sewers, Leo leads Mikey to an abandoned and secluded area he thinks would be perfect for a new lair. Mikey supports Leo’s plan, but says that he wants to stay in the apartment building so he can be near Shadow (whom he’s grown very attached to). Leo still intends to move back to the sewers and Mikey gets bummed out, realizing that they’re all separating and their old lives are over. Leo tells him that things aren’t over, just different. Out in the desert, the robot marches onward. *This story is continued from TMNT (Vol. 2) #2. The story continues in TMNT (Vol. 2) #4. *Raph mentions meeting a gargoyle that came to life. He’s referring to the events of The Savage Dragon #2 and The Savage Dragon/TMNT #1. *For the record, the address of Casey’s farmhouse in Northampton, Massachusetts is 42 Burr Hill Road. *The moving out conflict will eventually reach a head in Tales of the TMNT (Vol. 2) #57, where the Turtles decide how to divide up their time between the apartment, the sewer lair, the church and the farmhouse. *This issue also contained a back-up story, “I.M.P. part 3 of 3” by Jim Lawson and Eric Talbot. The main overarching theme of TMNT Vol. 2 continues, with the Turtles wondering what they’ll do next and all carrying out their plans to separate. It’s a very somber scenario, though I’ve already talked about it in my last review, so I’d rather not repeat myself. The locations they’ve all decided to branch out to seem to make sense regarding each Turtle’s personality and priorities. Don is living in seclusion in the farmhouse where he can focus and work (though he seems to be getting bugged by evangelicals and police quite a bit). Raph goes to stay in a gothic and atmospheric church that fits his brooding attitude. Mike wants to stay in the apartment to be near the kid he loves and because it’s the most “normal” setting. Meanwhile, Leo wants to move back to the sewers because that’s where the “good ole days” took place and he can’t see past them. While this issue basically just amounts to “house hunting with the TMNT”, it’s still interesting to see how each home reflects the attitude of the Turtle that chose it. And you know, I’d forgotten all about Raph choosing the church for a new lair in this issue. 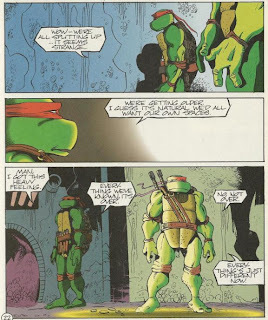 I had always thought the Turtles operating out of a church was something the Image series made up (though in that book it was the mausoleum near the church and not the church itself), but I see Carlson was just carrying on the plot point established in this story. The mausoleum lair doesn’t quite seem so random, anymore. Anyway, a couple more exciting story arcs also get rolling in this issue. 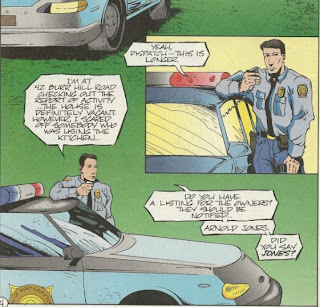 Baxter’s on his way back to New York for revenge, Braunze is introduced (and he’ll have a major role closer to the end of this volume) and who is this mysterious Officer Longer who seems to know Casey? Take a guess. As you can see, Vol. 2 is a bit of a slower moving animal than the previous volume, as Lawson takes his time setting up conflicts well in advance and getting into the heads of the main cast. For what it’s worth, I think Vol. 2 is paced pretty well, even if it starts out fairly decompressed. 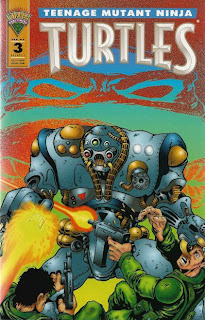 If you want a mind-numbingly slow TMNT volume, check out Vol. 4. The pacing in Vol. 2 will seem rapid-fire compared to that.